Tendon injuries are common in human athletes [1-4]. Furthermore, such injuries are also prevalent in the ageing sedentary population [5-7]. In recent decades, the incidence of tendon injuries has risen due to both an increase in an elderly population and a rise in participation in recreational and competitive sporting activities. In the general population the lifetime cumulative incidence of Achilles tendinopathy is 5.9 % among sedentary people and 50 % among elite endurance athletes . Despite the high frequency, there are still many unsolved questions and differences of opinion concerning pathology, etiology, and even terminology. Until several years ago the most often used word for tendon disease in the clinical practice of orthopaedic and sports medicine was ’tendonitis/ tendinitis’, literally meaning tendon inflammation, reflecting the general idea that overuse tendinopathies were due to inflammation. However, this common wisdom was challenged by that time, as the histopathological feature usually described in tendinopathies was a degenerative process and inflammation was not typically seen [8-11]. Therefore Nicola Maffulli suggested to use the term ‘tendinopathy’ as a general descriptor of the clinical conditions in and around tendons arising from overuse [12, 13]. In addition the term ‘tendinosis’, literally meaning tendon degeneration, should be used after histopathological examination. This nomenclature is gradually being integrated now in research communication and clinicial practice. 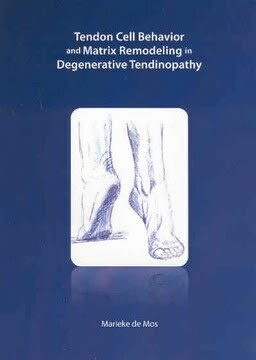 The clinical presentation of tendinopathy is characterized by a combination of pain, swelling, and impaired performance. A variety of tendons in humans may be affected including the supraspinatus tendon in the shoulder, the forearm extensor and flexor muscle tendons in the elbow, and the Achilles tendon and the patellar tendon in the lower limb. The respons of tendinopathy to the currently available treatment options is often unsatisfactory requiring lengthy periods of rehabilitation or even surgical intervention [14, 15].